Earlier today, we saw a leaked image of the Sony Xperia Z4 which will reportedly launch at the Mobile World Congress 2015 in Spain. Now, a new report surfacing from Chinese shores suggest that Sony is also working on a bigger tablet, the Sony Xperia Z4 Tablet Ultra, which will apparently come with a bigger 13-inch display. The specifications are more than high-end for a tablet, something which is not present in any tablet currently available in the market. As per the leak, the alleged tablet will come with a 12.97-inch Triluminos display sporting a resolution of 3,840 by 2,400 pixels, a quad-core Snapdragon 810 processor clocked at 2.86GHz paired with 6GB of RAM (which is highly unlikely to be honest), and 64GB of internal storage for your data. Furthermore, it’s said to come with an 8MP camera with a 1/2.3″ Exmor RS sensor with an f/1.8 Carl Zeiss Sonnar T* lens, a massive 12,100 mAh battery to make sure there’s enough juice for the tablet, and is apparently 8.6mm thick. Before you get a little too excited, we’d suggest you take this rumor with a lot of salt. 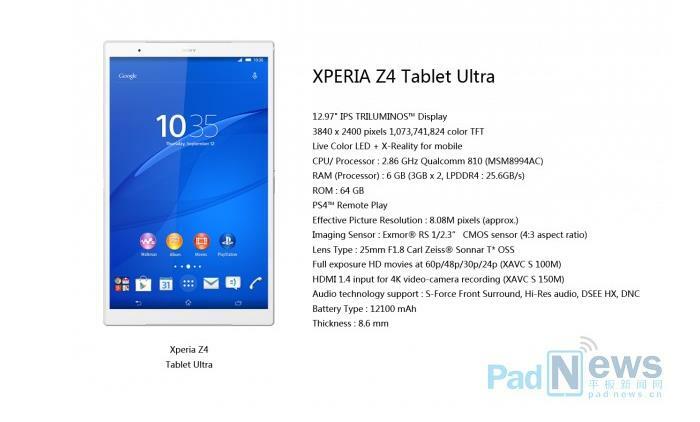 Sony could be working on a Xperia Z4 Tablet Ultra, but there’s no confirmation what so ever at the moment. We’ll update you as soon as we get to hear more about the alleged tablet, and if there’s any truth in this rumor.